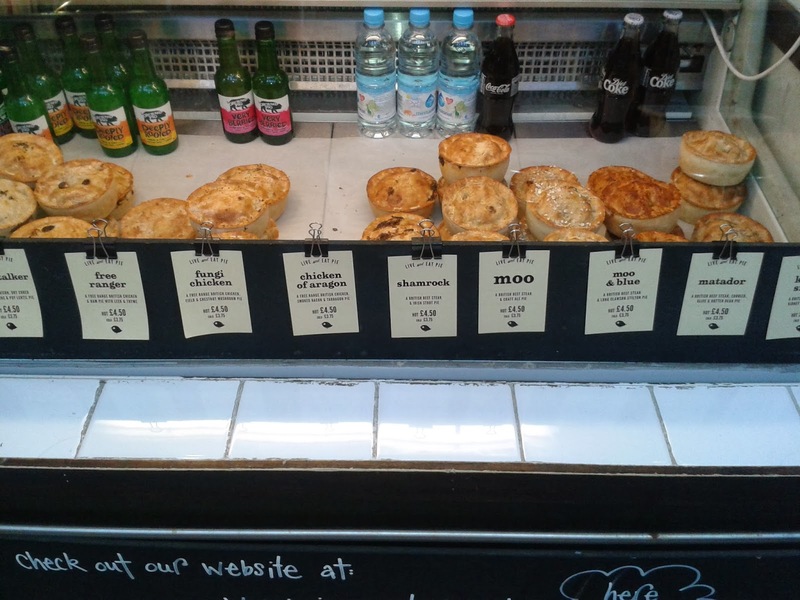 With a visit to Bristol to talk pie on local station BCfm Radio, only a fool would miss out on going to Pieminister in St Nics market in the heart of the city centre. 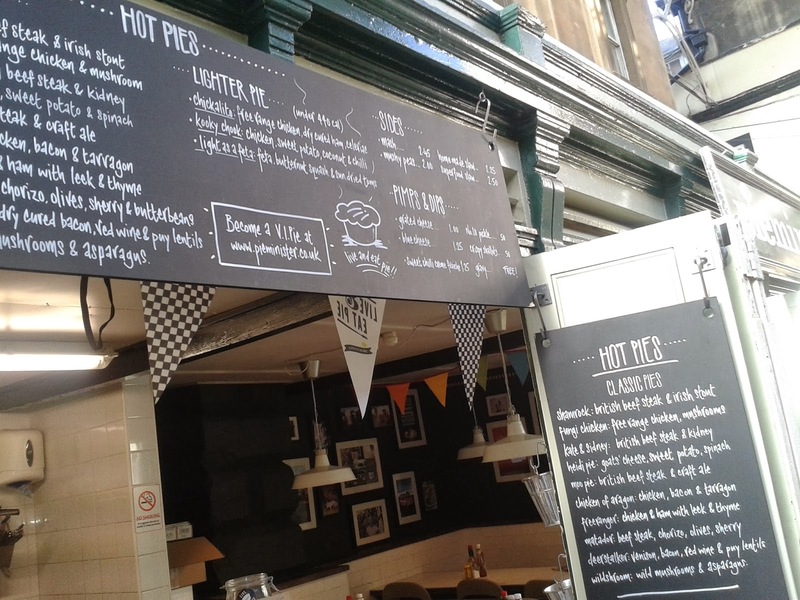 Situated amongst a number of small independent stalls and food outlets, the Pieminister stall has been in the heart of Bristol for just a few years less than the original shop in Stokes Croft. They focus on free range, British meat and try to source from within 50 miles of Bristol. And with a Shamrock pie on offer, one that I hadn’t seen before and we hadn’t rated, it immediately caught my eye. So with immediate comparisons to the “Moo” pie – the British equivalent – how would the Irish influence sway things? The pie looked in good condition and at £3.75 for a cold pie or £4.50 to eat hot, it is reasonably priced for an “eat out” option. Golden in colour, the pie pastry was surprisingly crispy on top and yet really nice. It certainly added a good crunch to the pie experience, which is often lacking when pies have been left out in a hot cupboard for too long before serving. However with the side and base pastry being so crisp as well, this did get a bit much. While being about as far from a soggy bottom as you can get, the dryness of the pastry did get to me a bit. Unfortunately I think this is due to slight overcooking, as the other Pieminister pies we have rated were not as solid as this one. Fortunately the content of the pie was far better. The pie had a very good viscosity of gravy, not leaking about all over the plate but noticeably there. 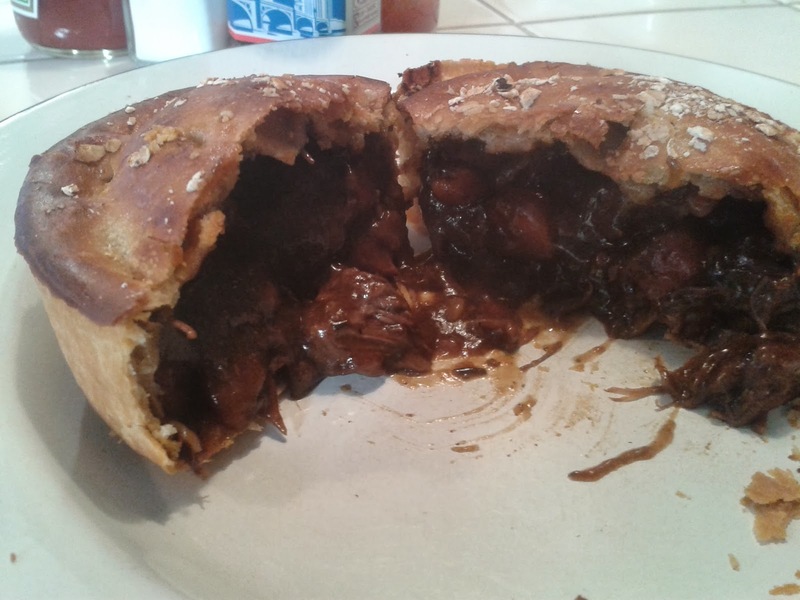 It provided a good contrast to the crisp pastry, though the pie shell left too much work for the filling to do, and would have rated even better if the pastry encasement wasn’t so crisp all the way round. The pie had good capacity, though there were some air gaps, but a strong amount of beef which was delightfully flavoured with the hint of Irish Stout. It was very meaty and left a good impression, though I would have preferred it to be a bit bigger. All in all, it was great to have a Pieminister pie in the home of Pieminister. They are a fine example of a local pie chain going global and set a benchmark for many of the smaller pie firms we have rated to as-pie-re to!